ARM mbed has an online IDE for C/C++ development available at http://developer.mbed.org. It is free to use and the BBC micro:bit is one of its officially supported platforms. 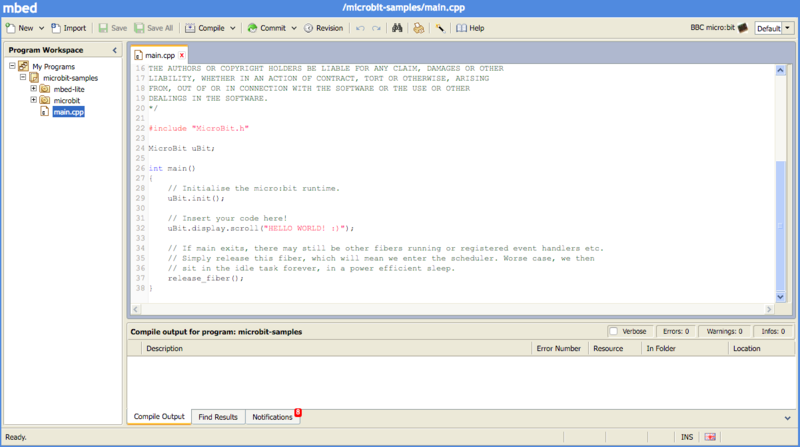 This online IDE provides a simple interface for writing, compiling and sharing projects like the micro:bit DAL, which is based on the mbed SDK. MicroPython is a completely text-based editor, perfect for those who want to push their coding skills further. A selection of 'snippets' are on hand to help auto-complete trickier tasks and a range of premade images and music are built-in to give you a helping hand with your code. ARM mbed has an online IDE for C/C++ development available at http://developer.mbed.org. It is free to use and the BBC micro:bit is one of its officially supported platforms. The online IDE provides a simple interface for writing, compiling and sharing projects like the micro:bit DAL, which is based on the mbed SDK. Create an account on developer.mbed.org. Visit the micro:bit platform page and add the micro:bit to your compiler by clicking the "Add to your mbed compiler" button in the right hand sidebar. Go to the microbit-samples project, and click the Import this program button for that project. The online IDE will open. Complete the import of the project and then select it in the sidebar and click the Compile button. The build will start. The first build will take longer than subsequent builds. Your browser will prompt you to download a file. Save this file locally, then drag and drop it onto your micro:bit. The copy triggers the orange LED on the back of the micro:bit to flash; it will stop flashing when the download is complete. When the copy process finishes, the micro:bit drive will reset and disconnect from your computer. At this point, your code will also start running!